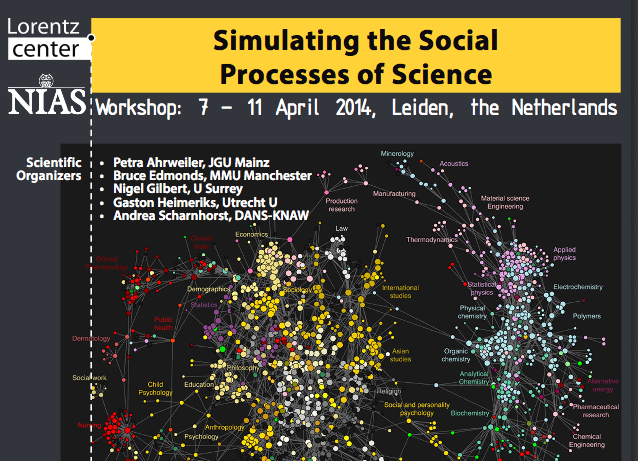 The aim of the workshop is to stimulate the development of simulation models of the inter-scientist processes that are part of the complex we call science. The workshop will discuss simulation modeling of the inter-scientist processes that contribute to the discovery, organization and verification of scientific knowledge. The focus is upon the development of simulations themselves, including models of: peer review, academic field self-organisation, citation networks, innovation, scientific reputation, funding allocation, cognitive models embedded a social setting, argumentation and social reasoning. Registration for the workshop is open: click here!